It's at times like these that I know just how Italian I am. I was with a friend on Wednesday evening when she got a text saying we had an Argentinian pope. My first thought? Oh good, he's probably of Italian stock! I logged straight onto Facebook and then Twitter, and met an explosion of Habemus Papams and excited announcements of his name, Jesuit-ness and first appearance on the balcony. The joyous exhilaration was palpable, almost leaping out of the screen at me! I managed to send a few messages to Jesuit and Argentinian friends, but had to wait till I got home before I could watch it all for myself, and feel truly part of the excitement, whilst marvelling at the pope's stillness in the midst of all the hubbub. A time for being grateful for 24-hour news programmes, and for Youtube, where I found his full balcony appearance and speech without translation. 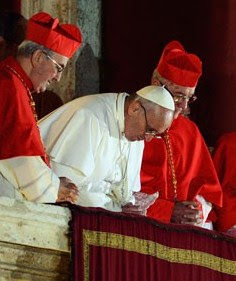 His words were indeed simple, heartfelt and unpretentious, as befits a man now called Francis. Francis of Assisi may have been small and scrawny, but he left huge sandals to fill. He was humble, gentle and filled with deep inner joy, a man who rejected ostentation and power whilst welcoming outcasts, a deeply spiritual man who burned with love for God and all of creation. And my prayer - and the prayers of millions of others around the world - is that our new Francis can be all that and more, for the good of the world and the Church. As always an excellent blog post that captures the news perfectly.